Cotswold Wildlife Park and Gardens is home to a diverse collection of over 1,500 animals from 250 different species, many of which are instantly recognisable, like the iconic Rhinos, Lions or Giraffes. Some of the creatures at the Park, particularly the more unusual looking or lesser-known species, incite a far more curious reaction from visitors such as: the Naked Mole Rats (with their elongated furless bodies and sizable teeth), the Brazilian Tapirs (with their prehensile noses) and giant rodent species – the Capybara (Hydrochoerus hydrochaeris). This exceptional Neotropical herbivore from South America is probably best described by zoologist Desmond Morris as “a cross between a Guinea-pig and a Hippopotamus”. It is the largest living rodent in the world and the last remnant of a long line of gigantic grass-eating rodents that evolved in South America over millions of years. The Park’s new breeding pair were introduced last year and bonded straight away. Due to their large barrel-like build, mammal keepers were unaware Belle was pregnant until they discovered the newborn twins by her side during their morning routine checks. Belle and Ollie are proving to be attentive first-time parents but the arrival of their first pups has not curbed Ollie’s amorous interest in his new partner (pictured right). Since the birth of their twins, the pair have been seen mating numerous times – an act that only takes between four to six seconds*. Keepers are hopeful the new family group will grow in numbers and the Park’s successful Capybara breeding record will continue. After a gestation period of 150 days, females give birth to highly precocial young – just as well considering the vulnerable pups are a food source for many large predators in their native homeland. Anacondas, Caimans, Jaguars and humans hunt this species for their meat. Newborns weigh approximately 1.5kg and are able to graze within hours of birth. They will continue to suckle until they are approximately four months old** and will stay with their parents for roughly one year. At just two days old, visitors and keepers witnessed the newborns tentatively taking their first steps into the water. The moment was captured on video and is available to watch here: https://www.dropbox.com/sh/3bufbsz5ucf87sg/AAAVSku1uUKkMjwtm5LirVKwa?dl=0 Water is a vital resource for this semi-aquatic species; it is used not only for drinking, but also to control their body temperature and as an escape from predators. Capybaras usually mate in the water. They can even sleep underwater by leaving their noses exposed to the air. Their water-resistant fur, partially webbed feet and position of their eyes and nostrils on the top of their heads enables them to remain almost completely submerged but still able to hear, see and smell what is happening on dry land nearby. Unusually for a rodent, even the male’s scent gland, which most other rodents carry on their cheeks, is on the top of his nose. Their scientific name (Hydrochoerus hydrochaeris) means ‘water horse’. In addition to the new Capybara pups, the Park is celebrating the births of several species: Ostrich chicks, Naked Mole Rat babies, Emperor Tamarin twins and Jungle Nymphs. Both the Seba’s and Egyptian Fruit Bats have recently given birth as well and are currently rearing their young under their wings in the Bat House. Keepers have also been hand-rearing the only Penguin chick from this year’s breeding season – a female named Marley (pictured right with 14-month-old onlooker Betty). After weeks of care from her keepers in the Park’s incubation facility, the chick has now been successfully reintroduced to the colony and recently enjoyed her first swim in the Penguin Pool, much to the delight of the Bird team. * Deforestation, habitat destruction and illegal poaching remain the biggest threats to Capybaras in the wild. Humans hunt them for their meat (in Venezuela) and their hides (in Argentina). Local people have used Capybaras as a food source for centuries and have even been seen wearing Capybara teeth as ornaments. *A Capybara’s vocal repertoire comprises of several call types: whistles, barking, purring, grunting, tooth-chattering, squealing and clicking. * A fully grown Capybara can weigh up to 65kg. 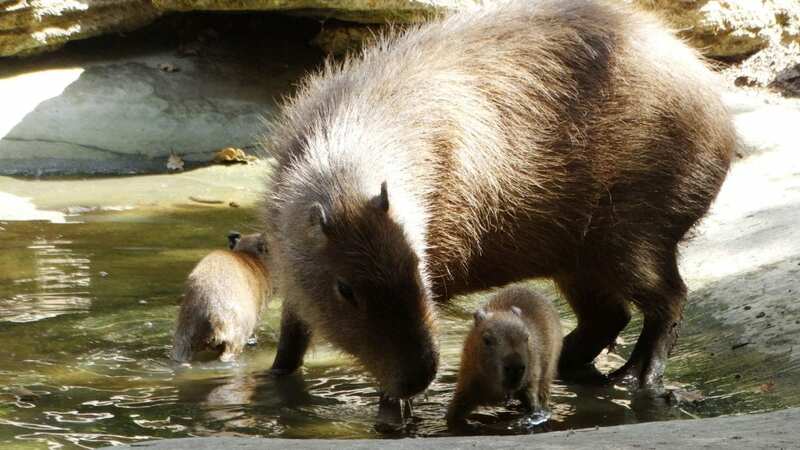 *Visitors can see the new Capybara family in the large outdoor enclosure they share with another South American species – the Brazilian Tapir. Cotswold Wildlife Park opens its doors at 10am every day†, with last admission at 4.00pm††- ENDS – For further information, please contact Debbie Ryan, Press Officer, Cotswold Wildlife Park on 07787 133837 or email ryan.debbie@gmail.com. †Except Christmas Day ††3.00pm during winter months. *Notes on the Mating Behavior of the Capybara, Journal of Mammology, Volume 49, Issue 3, 20th August 1968. **Ojasti J. 1973. Biological study of capybara.